Yes, we’re celebrating The Year of the Monkey but here at ELHQ we’re also revelling in the fact that just by just taking 2 days leave you can bag yourself a 9 day break! Chinese New Year – what to do with all that free time? Of course, we all want to jet away from Hong Kong and into the sunset ( without using up any of our annual leave), but don’t the flight operators just know it? Prices creep up on a daily basis and if you don’t book months in advance you have to accept defeat and pay that bit extra. Or do you? 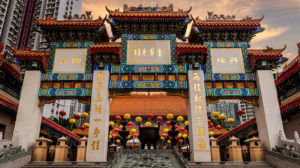 We’ve unearthed a few el cheapo places to head to from Hong Kong this CNY. Oh, and for all those new to Hong Kong this year, CNY is celebrated from 8 – 10 Feb.
Yeah, we think we could handle this for a few days! Type in ‘Hong Kong to anywhere’ and the Philippines will be bang up there in that top search slot – and not just for CNY. Cheap flights, amazing beaches, some of the best street food in Asia and that clear blue ocean. Quite frankly, we don’t know why we are not there right now! Luckily we have already been and written a whole guide on this beautiful country; from where to eat and drink to where to sleep. Yup, that is real..and that could be you! If it’s possible to have a crush on a place, then we have one on Yunnan. Right on our doorstep, picture-perfect, and pretty unexplored. Flights to China are always among the cheapest – don’t disregard them so quickly – that could be you in that picture up there! Read more on Online Editor Sarah’s awe-inspiring trip to the Banyan Tree in Yunnan last year! Just a skip and hop across the water and you will arrive in another Expat favourite. With so many regions to explore you don’t have to just spend days lazing on those stunning beaches. Bangkok is exploding with fun and culture, or why not head North up to Chiang Mai and check into a retreat. We’ve seen some pretty cheap flights still flying around for CNY still, so go and snap them up! Vietnam is the perfect family-friendly destination. Just over an hour’s flight from Hong Kong, you could be sipping your Vietnamese coffee before we even had a chance to battled the rush hour on the MTR. Fancy seeing that picture perfect photo above? Get the overnight train from Hanoi to Sapa and indulge in nature. It also proves one of the more wallet-friendly places on our list and has been one of our firm favourite get-aways here at Expat Living. Check out the last time we headed over to Vietnam with the family.